The rock cut shrine consists of a facade, a rectangular mukha mandapa and a sanctum, all facing east. The pillared mandapa in front of the rock cut cave adjoins the mother rock on all the sides. The roof of the mandapa rest on the mother rock nearly 1mt above the kapota, as like, the floor of the mandapa also adjoins the facade. The rock cut floor extension in front of the facade is overlapped by the mandapa floor and hence the rock cut floor is absent. The facade is 4.97mts in the north-south and 0.51mts in the east-west directions. It consists of two pillars in the middle and two pilasters each one on both ends. The pillars and the pilasters are square-kattu-square. The kattu is long than the squares and among the squares the lower square is short. Usually the lower square is shown high comparing the upper square but it is the only rock cut cave with short lower-square. The potikas are angular and decorated as taranga and patta. For the base four waves are shown, the fourth wave forming the intersecting one between the base and angle and for it a volute line is shown on the face of the potika. The angular section has five waves and after the second wave an inverted wave is shown for all the potikas, such ornamentation is not seen in other caves. The hands of the potikas hold the uttira and above the uttira is seen the vajana. The rough rock brow that extends as kapota is 0.46mts in the south and 0.35mts in the north. The canopy of the kapota is curvy and inclined down. The vajana not only run in the roof it also extend down along the pilasters on both the sides and also extends along the corners of the kapota in the front.11 The mother rock extensions on the sides are 1.51mts on the north and 1.69mts on the south at its lowest level in which 0.39mts is well formed side walls for the facade. Besides, a rock cut Linga is formed on the northern mother rock extension. Inscriptions are seen on the southern side rock extension, northern and southern pilasters. The anganas that formed between the pilasters range between 1.08-1.09mts in the facade which are closed with iron gates. The facade leads to the rectangular mukha mandapa13 which is 5.24mts in the north-south and 1.10mts in the east-west directions. The lateral walls of the mandapa are adorned with huge bas-relief sculptures of Ganesa and Gangadhara in the south and north respectively. The sanctum is in the middle of the back wall of the mandapa. The back wall of the mandapa are sectioned by heavy brahmakanta pilasters, two in the middle and each one at the corners,14 the middle two pilasters flank the sanctum entrance. The vajana is running through out the mandapa. On the eastern side or the posterior of the facade possess double vajana; one connecting the vajana of the mandapa that run throughout the mandapa and the other above the uttira shown in the facade and extending downwards along the pilasters as seen in the facade front.15 The roof of the mandapa is well formed. The floor of the mandapa in front of the sanctum is paved with stone slabs. The lateral walls of the mandapa are formed as niches and adorned with bas-relief figures. The niche on the south, that houses Ganesa is 1.34mts breadth, 1.92mts height and to a depth of 0.29mts. The niche on the north that houses the Gangadhara is 1.22mts breadth, 1.98mts height and 0.20mts depth. On the back wall of the mandapa an aperture is formed in between the middle two pilasters in about 0.28mts from mandapa floor to a height of 1.74mts and to a width of 0.83mts as entrance of the sanctum. The space between the pilasters on either side is formed as niches in which the northern niche is 1.02mts and the southern niche is 1.06mts. The niches are fully inscribed with inscriptions. Comparing the corner pilasters the middle two pilasters that flank the entrance are heavy. The potikas above the pilasters are replica of the facade pillars and pilasters, contour on the faces and the inverted wave also followed. The single hand of the potikas bear the uttira and above is the vajana buffering the uttira and the roof of the mandapa. The vajana that run above the uttira also extend to the lateral walls of the mandapa. Except sill the other components of the door frame are absent in the sanctum entrance. The sanctum is 3.16mts in the east-west and 3.23mts in the north-south directions and 2.17mts height, housing a rock cut Linga in the centre. The Linga is formed on a basement which has 1.52mts sides and 0.06mts height. The square avudaiyar formed above it is 0.87mts height and the sides are 1.50mts with a small gomukha formed in the north. The rudra bana is about 0.69mts height. Pit to receive the anointed water is absent instead a water chute is seen running upto the entrance and continued in the mandapa on the southeast. 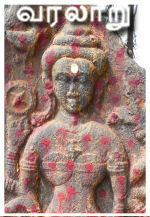 Vajana is seen on all sides in the sanctum roof. 2. Rock cut Linga in niche is also seen in Malayakkoil, Poovalaikkudi. 3. சு.இராசவேலு, அ.கி.சேஷாத்ரி, தமிழ்நாட்டுக் குடைவரைக் கோயில்கள் (Cave Temples of Tamil Nadu), பண்பாட்டு வெளியீட்டகம், சென்னை 2000.ப.174.ஜெ.ராஜா முகமது, 'ஆவணம்-19' புதுக்கோட்டை மாவட்ட குடைவரைகள் கோயில்கள், 2008. ப.178. The above said authors mention the mandapa as ardhamandapa. 4. ibid., சு.இராசவேலு, அ.கி.சேஷாத்ரி, 'அர்த்த மண்டபப் பகுதியிலும் எவ்வித வேலைப்பாடும் அற்ற இரண்டு தூண்களிலும் பக்கங்களில் இரண்டு அரைத்தூண்களும் காணப்படுகிறது'.174. There are no pillars in the mandapa only the back wall of the mandapa is sectioned with four pilasters. 5. Such double vajana is also seen at Thirumerrali also, in which the upper frame can be taken as valabhi, but the formation in both the places are typically vajana nature, generally valabhi is little curvy.